There are 8 posts in this thread, and it has been viewed 6355 times. The Orochi Saga was wrapped up in 1997. In '98 we were treated to a dream match. In 1999, it was time for some major changes. 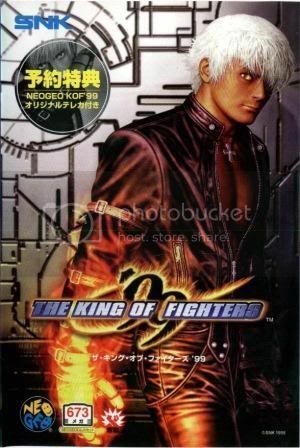 With a brand new storyline, a new protagonist replacing fan favorite Kyo Kusanagi and the main character, and the all new striker system, KOF'99 was nothing if not controversial. 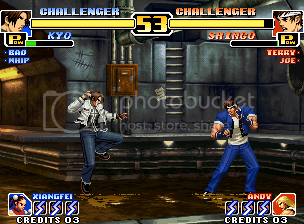 King of Fighters '99 is the sixth game in SNK's long running KOF series. It was the last game in the series to receive a NeoGeo CD or Playstation port. KOF'98 was very popular, but SNK decided to make drastic changes to the next entry in the series to keep things fresh. I never liked the moveset changes coming from '98. But I think '99 definitely has the strongest visual and audio presentation of the NG era KOFs. 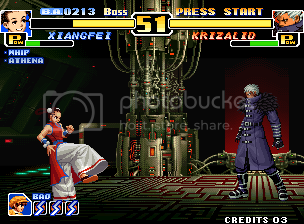 OK, KoF '99 might have some rough edges with it's not so welcomed changes in gameplay and it's new presentation, but it remains as a enjoyable installment of a legendary fighting games series. Think about K' or the NESTS saga how you like, but I still think it was a good change to put somebody else as protagonist than just good ol' Kyo. Compared to the character changes in the Street Fighter series (SFII<->SFIII) King of Fighters '99 and the following installments' replacements weren't that grave, so I believe SNK made nothing really wrong. The infamous Striker system isn't really everybody's cup of tea and I take that point, but at least it was a fresh and unused idea to set into the KoF universe, furthermore it leads players to try out new things. 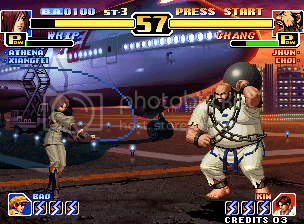 The only thing I don't really like at KoF '99 is the uninspiring artwork, I mean the genuine SNK studios were capable of making far better stuff imo. Overall SNK's second last "real" KoF offers nice entertainment for a few hours (and a fantastic Hero Team theme), but that's it. Great game one of the best KOFs, best of the 90s after 98. Classy backgrounds are its biggest draw for me but it also plays beautifully. This version does not get mentioned as much as it should but I class it as my 3rd fave after 98,03, the rain level as possibly the best KOF background ever. Any NG fan should really own this game as its defo in the top 10 NG games. 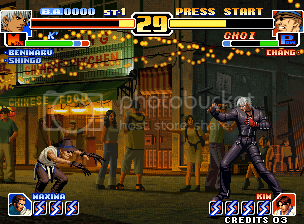 the rain level as possibly the best KOF background ever. The first time I played KOF'99 and it started raining on that stage my jaw literally dropped. It's definitely one of my favorite backgrounds in any fighter. I played 2002 before playing any of the NESTS Saga games, and I really took a liking to K', Maxima, and Kula. Kula didn't make an appearance in '99, but the addition of K' is very welcome to me. 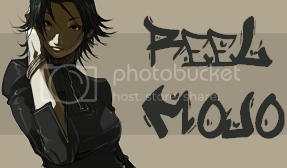 As a fan of Daraku Tenshi, the addition of Styleos as the new character designer is also pretty awesome. His impact is obvious to DT fans (K' is based on Cool, Maxima is based on Harry, and Whip is almost assuredly based on Lapis). As for the gameplay changes, KOF'98 pretty much perfected the formula so I believe it was time for a change. The fact that they keep things fresh is what makes KOF so interesting. I actually really like the striker system because it allows for a bit more customization. If you're fighting a mirror match, chances are you have different strikers so strategies are at least slightly different. I'll reply to this properly later (at work) but I'll just chip in for now and say that the rain background is one of my favourite ever KOF backgrounds. KOF '99 is definitely a high point in terms of stages and I adore the soundtrack to this game... possibly not my absolute favourite, but it's way way up there! Love the electronica sounding soundtrack. Love most of the backgrounds. Absolute best in-game character art. A huge improvement in presentation, over 98. One of the best looking KOF's, IMO. is an essential KOF, alongside my preferred KOFs: 95 & 03 (not forgetting 98 & 02 secondarily). This is mainly due to the amount of style and diversity 99 brought along with itself. I love the design and I enjoyed MOST of the character changes (except Robert).